Unterwasser, canton of St Gall, SwitzerlandIt was on February 27-28, 1990 and December 26-27, 1999 “Vivian” and “Lothar”, the two hurricanes, were respectively blowing at more than 200 km/h (124.3 miles/hour) over Switzerland! 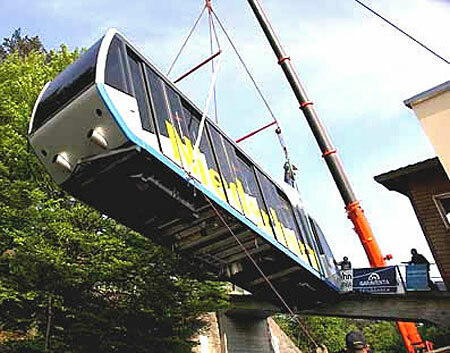 After the hurricanes, the Swiss federal autorities were worried about the stability of the funicular Unterwasser-Iltios in the Toggenburg Valley… why this funicular in particular ? 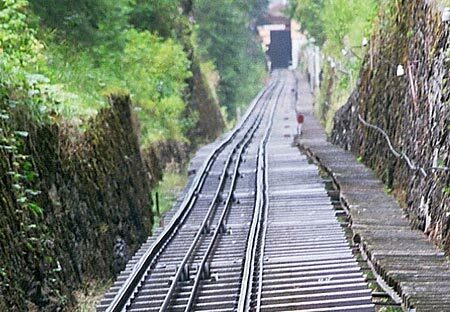 Because of the 0,80 meter gauge which was judged insufficient to ensure the stability of the cars in case of hurricanes. It was decided to enlarge the gauge of the entire line, from 0,80 to 1 meter. The iron bridges will be replaced, the rails will be removed and reinstalled over a new concrete base. On April 14, 2005 the two old red cars have been transported to Gangloff Bern to be modified to be adapted to the new 1 meter gauge. Modifying the old cars rather than installing modern new cars, it is the decision taken for economical reasons. 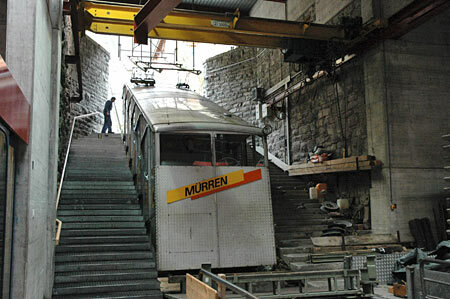 The funicular Unterwasser-Iltios will reopen on September 3, 2005. 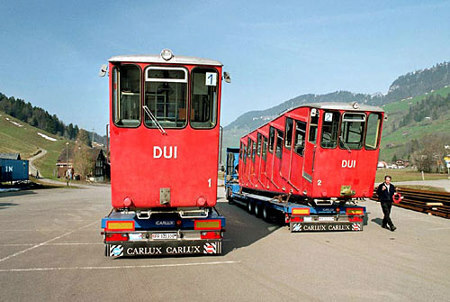 The replacement of the old cars by modern ones is planed for 2012. More informations on Jörg Walker site. Author FunimagPosted on May 22, 2005 September 22, 2006 Categories SwitzerlandTags St Gall, Switzerland, UnterwasserLeave a comment on Hurricanes vs funicular ! Beatenberg – The first car delivered… and crashed ! Beatenberg, canton of Bern, Switzerland.Thursday May 12, 2005 the first car “Niederhorn” was delivered by Gangloff and installed on the rails. Unfortunately, a mistake was made during the installation of the car on the rails… the car run down six meters and hit the bottom platform ! The car was damaged, and was taken away again back to Gangloff in Bern to be repaired.The opening day is still planned for June 25 but might well be postponed! Author FunimagPosted on May 14, 2005 September 22, 2006 Categories SwitzerlandTags Beatenberg, Bern, SwitzerlandLeave a comment on Beatenberg – The first car delivered… and crashed ! Lauterbrunnen- Grütsch Funicular in Jeopardy !! Lauterbrunnen, Bernese Oberland, Switzerland, April 2005.This is not a scoop… the funicular Lauterbrunnen- Grütsch is in Jeopardy! When I visited it in July 2000 it was already in Jeopardy. The ground is unstable and moving. _Consequently, the track is distorted as you can see_ on the picture below. September 2005, I went back again to visit it… the ground is still moving ! The death threat is stronger than in 2000! A solution must be agreed upon by the end of 2006. – an aerial cable car on the same site as the present funicular (CHF 20 Millions)… The top station would be the same Grütsch station. It means that the extraordinary machine which presently takes charge of the freight transshipment between the funicular and the Grütsch – Mürren train will be retained for the pallet transshipment between the aerial cable car and the train ! The company Bergbahn Lauterbrunnen – Mürren (BLM) is for the aerial cable car solution, which is the less expensive. The Lauterbrunnen Town Council and the people of Mürren are for the rebuilt of the funicular but this solution is too expensive for BLM. A decision must be taken before the end of 2006. Author FunimagPosted on May 8, 2005 September 22, 2006 Categories SwitzerlandTags Bern, Lauterbrunnen, SwitzerlandLeave a comment on Lauterbrunnen- Grütsch Funicular in Jeopardy ! !